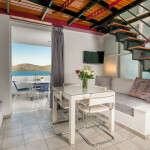 Elounda apartments Markakis is a group of apartments for rent in Elounda. 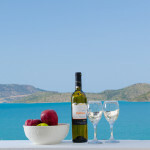 Those holidays apartments are situated in Elounda village, the famous vacation resort, in the Eastern Crete region in the area of Schisma (east side of Elounda), just 10 km. from Agios Nikolaos and 75 km. from the Heraklion airport. The nearest beach is just 250 meters and the bus stop to Agios Nikolaos is located 250 meters from the apartments. In addition, at 300 meters is the central square of Elounda with many restaurants and traditional tavernas and the village harbor where boats depart to the destination of the historic island of Spinalonga. In a very short distance from our apartments are also supermarkets and pharmacies. Elounda attracts thousands of tourists every year, wishing to taste the unique Cretan hospitality, the spectacular views of Mirabello bay, the historical island of Spinalonga, and the picturesque beaches. The holidays in Elounda Markakis apartments are a sensory journey, a unique experience to share with your loved ones, friends or family. This experience, in combination with the heartfelt hospitality of the Psimarnis family, will accompany you throughout your life. 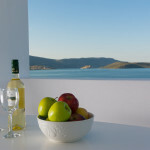 We hope you will enjoy your holiday in Elounda Markakis apartments. 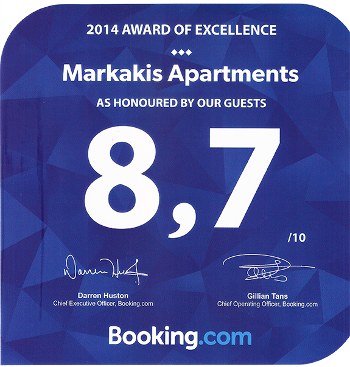 Having stayed in Elounda on package holidays several times before, we decided to put together our own package and came across Markakis Apts. What a stroke of luck. We booked late and were given the last apartment available. A two bedroom apartment at the same price as a one bed. Apartment was spacious, modern and spotless. Best of all was the family who own the apartments, Dimitri, Rena and their two sons Michael and Lefteris. They are a wonderful family and treated us as friends from the start. 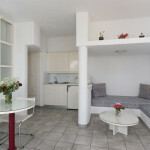 Apartments are a short stroll to the Tavernas on the seafront and five minute walk into the central square where the locals and their children gather in the evenings. Definitely going back next year, for a four week stay this time. The apartments are owned by a friendly and hospitable family who are ready to help any time. 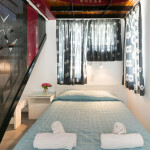 The location of the apartment is within 5 min walk to Elounda center, bus station, restaurants and shops. We had very comfortable stay in Elounda and will definitely come back next year. 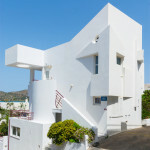 I just wanted to say that having stayed in Elounda many many times I thought these apartments would be noisy as they are only one block away from the main road into the village however how wrong was I.. We had a ground floor 1 bedroom apartment I thought the bed was too hard but after a couple of nights that was it , it was so quiet that slept every morning till 9.30 or even later (I needed sleep! )… even at night when we sat on the patio we were never disturbed by noise. The owners are a super friendly without being obtrusive, genuine and generous. The apartments are well serviced and we look forward to visiting them again very soon. Room Tip: All rooms have aircon- if view required then you need an apartment at the top. people who like us! you?